There’s a lot of hoopla regarding pasta with vodka cream sauce. Some say it’s the cure for what ails your pathetic love life, others say it’s gonna get you hitched and the rest think it’s just about the best pasta sauce ever. Meh, I’m not convinced. I mean, I love vodka, I love cream and pasta holds a special place in my heart, but I don’t think this sauce is the be-all-end-all of anything. It’s good, it’s simple and it’s rich, but I’m certainly not going to drop my drawers after a bowl of this. I made this pasta with vodka cream sauce a little while ago after consulting various recipes and creating one of my own. Not surprisingly, my husband loved it. Maybe there is something about it working it’s way into a gentleman’s heart, but for me, I like something a little more complex in flavour. So the next time we ate pasta, I used the rest of the farfalle box and created something that I thought was ten times more delicious. It didn’t leave me hot and bothered either, but it was simple, tasty and oh so fine. I wish I could have snapped a photo but it was gobbled up way too quickly. 2 recipes, 1 box of pasta. Take your pick. 1. In a large skillet, melt butter over medium-high heat and saute onions, garlic and chili until soft, about 20 minutes. Add in vodka and tomatoes and let everything come to a nice slow boil so that it bubbles but doesn’t splatter and go nuts. Pour in cream and turn down to a simmer. 2. Meanwhile, prepare pasta according to package directions. 3. When pasta is done, drain but reserve a little of the pasta water. You may need to add more water to the sauce if it’s too dry. Use your judgement. Gently add pasta to skillet and stir in cheese, adding salt and pepper if necessary. Stir pasta well to coat, reducing some of the sauce if necessary or adding in some pasta water if it’s too dry. Serve in large bowls with parsley and extra parmesan cheese, if desired. When pasta is almost ready, prepare the sauce. In a large skillet, melt butter and oil over medium heat, adding in garlic and red pepper flakes and saute until fragrant but not brown. Add in lemon zest and juice and about 1/3 cup of pasta water. Reduce slightly and stir in cream, ham, peas and pasta. Add parmesan cheese and parsley and stir. Add more pasta water if necessary. Salt and pepper as needed. I think I´d like the second version better, too. Keep the vodka to make a drink with some of the lemon, that will make it even better, I bet. I never believed the hype anyway, but I’ve never tasted this pasta either. I think I would agree with you 100%! I’ve heard about the vodka sauce too, although I’ve never felt inspired to try it. Now i know I don’t have to! Your ham and pea recipe sounds delicious. The lemon sauce has certainly got my attention! Both sound delicious though. funny how that pasta sauce has made the rounds! helen, don’t believe the hype! lyb, you’ll just have to try both out and see which one you prefer! really? i never heard of vodka sauce doing all that. and its not all that great either. My husband would pick the vodka sauce, but I would definitely go for the ham and peas. go ahead kate, let me know how it goes! cakespy, people who don’t like dessert? really?? cookie baker lynn, funny how that goes! We love vodka cream sauce ramped up with lots of cherry peppers (instead of pepper flake) in a local specialty we call ‘Chicken Riggies.’ So good. But it’s probably a regional thing, this love affair of mine. Hi! I just found your blog and I’m digging it. I actually was always very skeptical of vodka sauce, but the scientist in me reminded me of something – a lot of the compounds in peppers and tomatoes are only soluble in alcohol, so adding vodka releases those compounds. It’s like adding wine, but without the wine-y flavor. Here’s my version of vodka sauce. Now that I know why the vodka is in there, I like it a lot more (besides, who doesn’t love cream + tomatoes + pasta)! i love lemon, peas and ham with pasta, but i will totally drop trou for a truly excellent pasta with vodka sauce (which is really hard to find). i’m not de-pants-ing for any old red sauce with a splash of cream and 2 drops of booze. pasta with ham and peas….my favorite! Can’t wait to try it. I guess pear vodka wouldn’t really work in the vodka sauce…that’s all I have in my freezer….makes a great drink though! 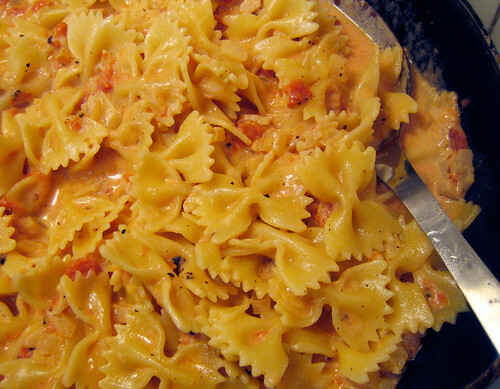 Bow ties are one of my favourite pasta shapes…and pasta is such a quick and easy “meal on the run” to prepare. Although I don’t eat as much pasta as I used to because the hubby does not care for pasta – I do enjoy it a lot when I finally do make it. 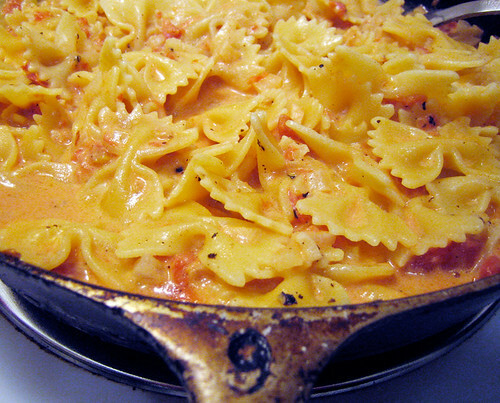 Vodka cream sauce sounds yummy – I guess I’ll now have to purchase a bottle of vodka – eh? I have been lurking around your blog for quite a long time now and felt that I just HAD to finally say Hi! Vodka sauce all the way. Yummm. mrs w, i’ve never had cherry peppers, so call me intrigued! hag, stick with drinking the pear vodka and give the ham and peas pasta a try! roopa, thanks for commenting! i do like vodka in tomato sauce, but not necessarily this recipe so much. not that it was awful, it just wasn’t incredible. haha, michelle, thanks for the laugh! bijoux, vodka should be a household staple. apparently, it cleans mildew from showers! haha. but i’d rather drink it than clean with it! rina, thanks for finally commenting! fibre, it’s good to know that i’m not the only one! I have to agree with you on the vodka cream sauce – I’ve never been a huge fan. I think there’s a recipe in rebar that uses a lemon vodka cream sauce? And it is quite delicious. I’ve been really craving pasta and yours looks so good. Thanks for letting me know where I can find seitan! I was wondering if I could even find it at T&T; maybe under another name. Do you know where to find tempeh? The Ham and Pea recipe looks FANTASTIC! eatme, i’ll totally have to check that one out! if it’s from rebar, it’s got to be good. Although I enjoy a vodka sauce ordered out, I prefer to make it myself, too. I use stewed tomatoes that I chop into bite-sized pieces and I use a ton of garlic and hot pepper flakes. And I only add a little bit of cream, just enough to turn the sauce from red to pink. I think the way they make it in restaurants is waaaay too rich. And I wish all vodka sauces were chunky like mine is! Hrrrmmmm… I actually LOVE vodka sauce, but I have to admit the few times I’ve had it outside of my own kitchen, it has not been that great. I’m thinking my recipe must be getting something right the other ones aren’t. It’s definitely a dish where you have to be very careful with the ratios of things – or everything tastes off. Especially if you go heavy on the vodka – ick. You just want that subtle spicyiness of the booze in the background of the dish. From the picture of yours, I’m gonna say you probably went too heavy on the cream. It’s better when there’s just a splash of cream, and it’s more of a tomato based sauce. I would stick to just a little olive oil rather than butter (the spicyness works better with the vodka), start off with a little bit of some pancetta or prosciutto fried up, and then really cook the tomatoes down until their juice evaporates and they just start to caramalize and concentrate. Use the vodka to deglaze the pan, and then add the cream in when the alcohols cooked off. Oh, and it’s better with pasta the sauce can stick too, like rigatoni or penne. And if you still don’t like it after all that, well, then I guess you just don’t like the stuff.